No trouble finding a wintry picture for the newsletter this year! It is two days before the Soltice, and so far we have had lots of winter fun thrown at us. 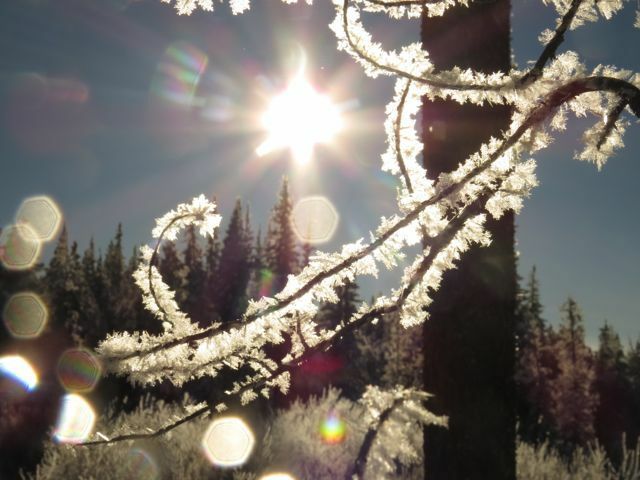 Mid November we had 10 days of gorgeous sunshine – and consistent -24C temperatures. It was ended by snow – but that mostly melted. A week later it started to snow again – and didn’t stop for 3 days. It was supposed to end with a drop in temperature to -27C, but I awoke to minus 36C and again that lasted for 3 more days. It warmed to a very comfortable -20C in the afternoon and the snow was fabulous. Fluffy and dry, great texture for snowshoeing, and lots of sun. And it wasn’t even December yet. I was snowed in for over a week as the neighbour who usually ploughs me out broke his machines and I had to find someone else – everyone was really busy so I was at the bottom of the list. Gradually the weather warmed and it got duller. The snow was still excellent for tramping about it – but then it rained. People often wish me “a warm winter”, but warm winters cause nothing but trouble. Two days of downpour turned the ploughed areas to a solid sheet of ice. I could not walk across the yard – I had to tramp the long way round through winter-boot-top rotten snow just to get to the outhouse. I didn’t dare try and drive the 4 km to the Highway. Fortunately, the big thaw ended with snow again, and it bonded sufficiently to the ice to give traction. But…. it stayed warm, and in winter, that usually means dull. The next problem was a power crisis. My solar system simply shut down. I had kept the very heavy, very expensive batteries topped up – they should last 9 years and mine are only 3 years old – and thought I had been watching my power consumption. The man who installed the system lives 2 hours’ drive away – but he was in Alberta for 10 days. Another electrician friend, who did some wiring for me when I first moved into this house, lives 7 hours’ drive away. At Nuk Tessli, and during my first years at Ginty Creek, I had a very simple and small power system that was easy for my little brain to handle. But the one I had installed after selling Nuk Tessli is much more sophisticated. It has so far been trouble free, but too complicated for me to figure out. I was really worried I had done some serious damage. I was reduced to no Internet, no running water (the well pump couldn’t work) and the dim glow of candlelight during the long, dark nights. I read a lot of books! On top of that was the dim glow of daylight, filtered through a layer of ice fog, during the short and dreary days. Suffice it to say that, over the next few days, by phone and email, I learned a lot about my power system. I learned that I can run the Internet and computer directly from a generator, bypassing all the solar stuff, and that is how I am writing this letter. There was a cable that was supposed to charge the batteries from the generator, but although I ran the stinking, noisome machine for a day and a half, obviously the charger wasn’t working. I could melt snow for water – tons of that lying around my door – my only real worry was the freezer. It is outside, and the temperature ranged from -12C at night to -8C during the day, so things would stay frozen for a while. If it warmed up too much I would have to phone people on the grid and see if anyone had freezer space. Another problem with warm, dull weather is, strange as it may seem, that I use more firewood. If the sun shines into the house, no matter how cold it is outside, the stove has to go out – often a door or window needs to be opened. If the sky is overcast, even if it is not particularly cold, I need to keep feeding the fire. So bring on the cold and sunshine! At least, in two days, the days now start getting longer. By the middle of January it will be amazing how much more light gets through to the solar panels even in dull weather. 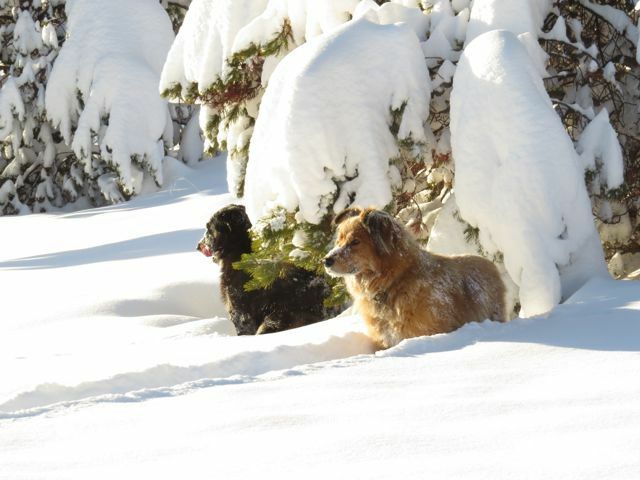 One thing is for sure – we will definitely have a white Christmas this year! 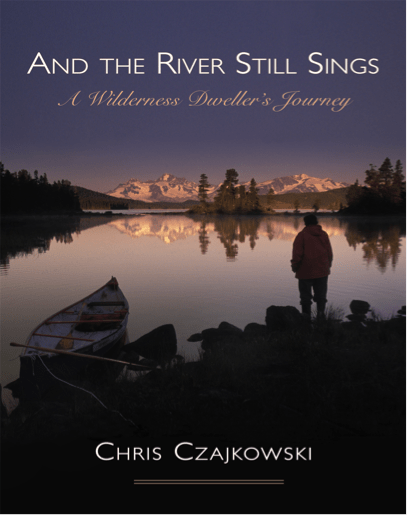 The release of And The River Still Sings, a book that covers most of my life, trying to show why I became a wilderness dweller. 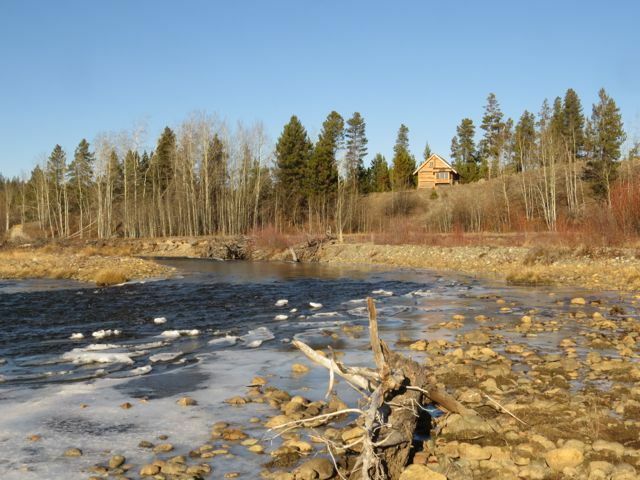 Listing the river property at Ginty Creek for sale. And The River Still Sings – my 11th published book – has done quite well. For the month of October I travelled around southern BC and gave about 26 slide shows. On the whole I had good audiences and made quite good sales. I have yet to hear from the publisher how the sales went at her end. I won’t know the details until July as I won’t receive the royalty cheque until then. At the same time, a tenth anniversary edition of Lonesome was also issued. It has been by far my best seller and the publisher put out a hard copy with a very attractive design. Ginty Creek boasts 2 properties, both about 40 acres. I built the first cabin on the river property because I needed a place inb a hurry and it had road access. 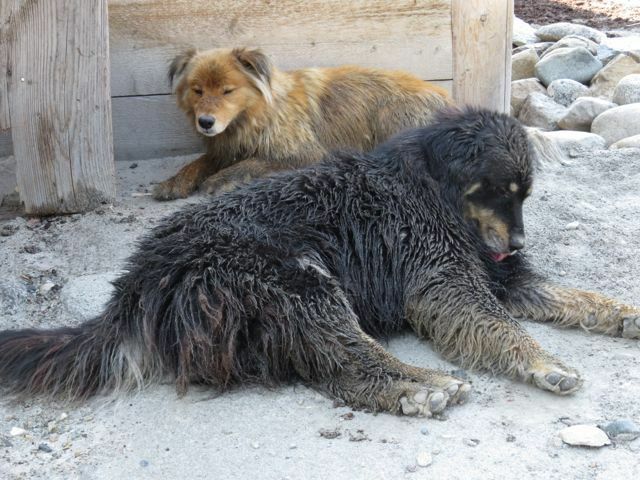 I went to Nuk Tessli in the middle of July with some apprehension. It was to be my first major hiking attempt since having a knee replacement 15 months before. The knee was still swollen and painful – not a great deal better off than it was before the operation. It is easy to say in hindsight that I would never have had the op if I’d known about all the frustration and disability it would cause, but I took the advice of the medical profession – one of the few times I have listened to them – and am stuck with the results so have to adapt. Fortunately I am a fit and well-coordinated person so this has not been too difficult, although of course the lameness is frustrating. I have since learned a lot about arthritis – my other knee also has it, and during this time it has got no worse. I will be reduced to being in a wheelchair before I have anything like that done again. I flew into Nuk Tessli with friends. First we went on a 3-night camp trip to my favourite alpine plant place, Gentian Valley. The summer had been very dry and hot – as it was to remain for most of 2014 – but it was our luck to have violent winds and storms during our visit. Rain was fairly light, but enough to be a nuisance. The wind was the worst. It was so bad we had to put rocks on the pot lids to stop them blowing off while we were cooking, even though we had chosen a fairly sheltered spot for our fire. And the bluffs where the flowers grew were so exposed to the violent gusts, and slick with water, that we had to turn back without seeing many of my favourite flowers. After my friends flew out, I remained to guide a few tourists. The weather stayed poor – it was only on the last hike that we had a really beautiful day that made the whole experience worth while. When I left Nuk Tessli in 2012, I was not sure that I would ever get into these meadows again so I was thrilled to achieve this. It was without doubt the highlight of my year. I hike more slowly than ever, but the new owner of Nuk tessli doesn’t mind. We are already planning another guiding trip for 2015. It will be the third week in July. If you know of anyone who would be interested, check Nuk Tessli’s website: nuktessli.com I will be posting soon on my own website as well. And now, as I write this, the sun has actually managed to ease through the ice fog. It is not quite strong enough to cast shadows, but I cannot look it in the eye – and that’s all my solar panels need. I can go and turn that *&$#* generator off! Oh Sun, who giveth all things birth, Please shine down upon the earth. If that request is much too grand, Please shine down on this our land. If even that’s too much for thee, Shine at any rate on me. What price are you asking for the property? Ahh Lassie you really have True Grit when it comes to climbing the hills on weary limbs. I tip my hat to your bravery and determination & love the photos. Hope to make a trip out myself some day soon walk through that meadow of wild flowers…. Always a pleasure hearing from you..
Again, so glad you were able to visit Nuk Tessli this past summer. 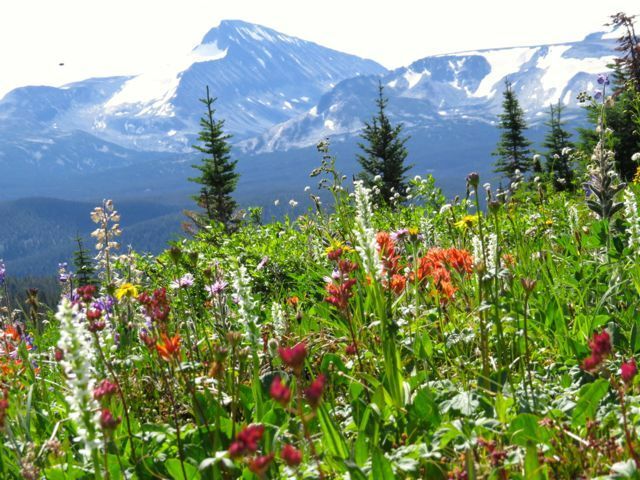 What a beautiful photo of the flowers in the mountain meadow! Now that the longest night is behind us we look forward to the days when we won’t have to worry about our solar system. Our generator has had a workout, too. Good to know you will be visiting your mountain meadows this coming summer. as much as I enjoy reading your posts and books, this last picture of the dogs is a good chuckle. enjoy your winter solstice: may it be “sunny and bright”, not to mention: cold!